Christmas is just ripe for the horror genre to twist and mutilate. There’s just something gleeful about taking a wonderful holiday and turning it into your worst nightmare. Gremlins, Black Christmas, Christmas Evil, Home for the Holidays … it’s a never-ending list of quality holiday ruining. And I love it. 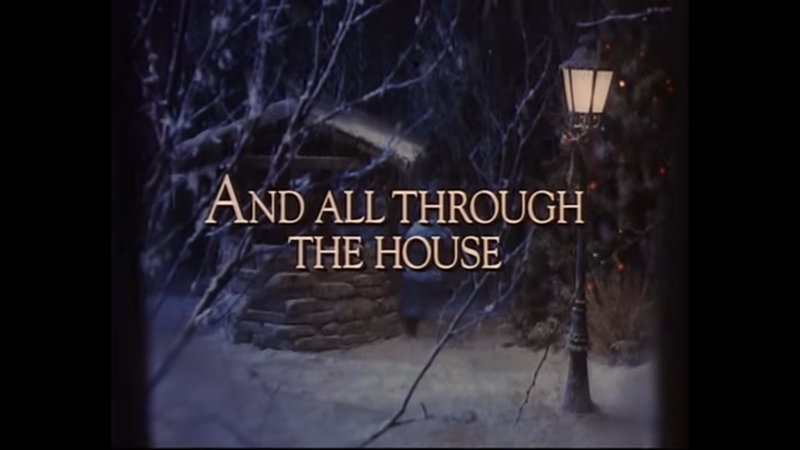 “And All Through the House” is an early episode from the show, season 1 episode 2 from 1989. And it already shows the greatness Tales from the Crypt would be. I mean, it’s directed Robert Zemeckis and a screenplay by Fred Dekker (who’s written some of the best cult films). The pair create a rather ghoulishly fun 20-minute show. Her young daughter runs down the stairs to check if Santa has been by, her mother becomes flustered and rushes her daughter up the stairs before she can notice the hole in the forehead of her step-father. The little girl pleads her her mother to open the window as it’s too hot for her in the house. The mother obliges before heading outside to dispose of her husband’s body. She calls up her presumed lover and tells him that her deceased husband’s money will be all theirs. Then proceeds to wrap the dead man’s head in a plastic bag (a la Black Christmas) with a rather festive red bow on top. As she drags the body out of the house, she misses the radio announcement than a man who murdered four women has escaped from the local institute for the criminally insane earlier in the day. Oh and he’s dressed as Santa, of course. While trying to dispose of the bloody evidence, the woman misses the fact that someone steals the ax off the nearby chopping block. Before she can throw the body down the well, she’s attacked by Meth-Face Santa, the escaped patient. After a tussle, the woman gets inside the house and away from Ol’ Rotten Teeth. She calls the operator, but spots her husband’s corpse spread out on the lawn like a starfish. So she hangs up instead of, I don’t know, blaming it on the ax-murderer terrorising her. Though she eventually gets to this idea after getting a phone call warning her about the escapee. She chops the man when he attacks her through the window and calls it a day. While she’s busy faking her attack to the phone, she misses the fact that the man is being called up by her daughter through the open window. When she finally notices that the body of the Santa has moved, she’s already late. Her daughter is hand-in-hand with a man waiting to give her her just desserts. “And All Through the House” is pretty dark and fun, and we even have the Crypt Keeper reassuring us that the daughter is safe. Not much is better than watching an awful person get a taste of their own medicine, especially when it’s well written and directed. And ax wielding has to be a part of the Christmas tradition at this point.